Campbell Burton at the Napier Quarter in Fitzroy, Melbourne. Campbell Burton is one of Australia's leading sommeliers, having won Gourmet Traveller's 2014 Sommelier of the Year award, and is totally obsessed with natural wine. 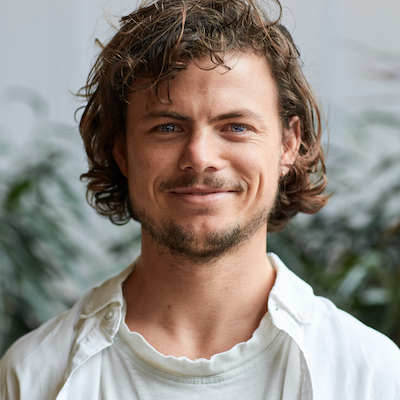 We talk to Campbell about his love for natural wine and the organic, sustainable farming methods that produce it. Mathew Bate: When we're talking about natural wine, should we be using the word natural? Or should we be using the term additive-free? Campbell Burton: [For me] additive-free is so clear, but it's becoming such a contentious issue. I choose to use the words additive-free and organically farmed because it's clear and it's really transparent. It means that this bottle of wine contains organic grapes and nothing else. And you can call that whatever you want, but that's clear. And "natural" wine has meant, especially within the Australian industry – and social media has a lot to do with this as well – fifteen different things. So the term essentially is quite hollow. I'm not saying it's a bad thing but it's not easy for the consumer and I think the consumer has a right to know what it is that they're buying and what the structure and the flavour of the wine is going to be like. There's no point in either a sommelier or a retailer, or whoever is selling the wine, to say that this wine fits under a particular banner if that's, let's say, a natural wine and for a whole host of different styles of wine to fall under that banner. We need to make things easier for the consumer because wine's confusing enough. That's how I feel about it personally. I'm interested in your journey into natural wine. When did natural wine, or should I say additive-free wine, originally spark your interest? I think the very first time I ever tasted unfiltered and unsulfured wine was in about 2008. I was just blown away by it. I would hold bottles of wine and just go this is the best thing I've ever seen. There was so much to think and talk about. I didn't realise that you were allowed to do that in the world of wine that I thought was so pigeonholed. I actually didn't realise at that stage just how much the conventional world of wine is based on rules that have got nothing to do with digestibility or nature. It's based on human rules about what a wine should look like and taste and smell like. Most people when they begin working in wine are led to believe that that's what exists in the world of wine and there's nothing outside it and anything outside it is incorrect. It doesn't fit within the framework of what you're supposed to learn about. I will never forget the very first time I tried a bottle of additive-free wine from Frank Cornelissen. It arrived at the City Wine Shop where I was working and I think someone had actually ordered it by mistake. It wasn't supposed to be there and I just thought it was the best thing I'd ever seen. There were solids floating in the bottle, it was a pale red color and the flavors for me were completely non-identifiable. When you're working as a sommelier you're supposed to be good at saying this wine tastes the way that it does because it's being fermented with whole bunches, it's had a long or a short maceration or it's been made in stainless steel or oak and all that sort of stuff. I began tasting these wines with no clue as to what chemical process had actually made them this way and I was completely fascinated by it. Sipping on a sublime glass of organic, additive-free red/white by Sam Vinciullo (Margaret River, WA). It seems that you've got a penchant for learning and additive-free wine was like the ultimate challenge, a thing that you could go as deep as possible into. Exactly. So it was after experiences like that that I knew that I had to then go and do as many vintages as I could so that I could answer these questions. If for no one else than just for myself. I did vintages in 2011, 2012 and a little a little bit of 2013 in the Yarra Valley with Mac Forbes. Mac was a very, very good friend who gave me a lot of opportunities to experiment with ferments and to learn. But then in 2013 my wife Charlotte and I were incredibly lucky, we got to go to and do a vintage with Claude Courtois in the Loire Valley [in France]. Is he a bit of a guru or something? Yeah so this guy, for the last 30 years, has been regarded as one of the godfathers of good farming and additive-free wine. We were forewarned before going there. Like a lot of people from the French wine industry found out that we were going and they would say "You've heard about Claude haven't you?" and I'd say "Yeah sure, we're happy to work hard." Claude turned out to be a pretty distinctive character. I'd never met someone who was so venomous about wines that had had things added to them. He's very principled about it. We would sit every single lunch and every single dinner and drink a few glasses of wine and I'd never had that experience before, because everything we were drinking was additive-free. I didn't ever realise that you could drink wine at lunchtime and go back to work and I certainly would never encourage anyone to do that. I don't endorse that but the point is I'd never gone day after day after day only drinking additive-free wine. It just took me a few days and I realised that I was getting to taste the difference in soil, the vineyard and the sunlight. To fully grasp how captivating they are you can't drink one additive-free wine every six months. I would ask anyone now who has an interest in this topic to only drink additive-free wine every day for one week and then see what happens at the end of the week. It's transformative and it’s a very different experience to drinking conventional wine. That's what I found and my wife was the same. Was this like the turning point for you? Yeah it was, partly because we had enough days, in a row, of drinking only additive-free wine but also it was because Claude made a real point of expressing just how much he loves “pure” wines and also how much he abhors “impure” wines. I'd never seen someone in the Australian wine community have so much black and white communication about what they think is good and what they also think is bad. Because culturally in Australia we're very happy to say yeah that's good but we find it difficult to express that we don't like something. Again, generally speaking that's my impression. So it was a bit of a wake up call. I'd never seen someone that could take a stance, even if it meant losing friends, and say that I do not like that product. Again, it doesn't matter whether it's butter or footwear or organic wine. But also, and perhaps more importantly, for entree every single lunch we would have tomatoes because they were in season. Claude has nine or ten rows of tomatoes growing beside the vines every year. His wife, who hilariously is named Claudine, would make a very simple salad with a little bit of oil and a little bit of salt and these insane tomatoes. I realised at that point that I had no idea, at 31 years of age, that tomatoes could taste like that. And this is one of the other reasons why Claude Courtois is so well revered within not just wine but agriculture in general, because he is a fantastic farmer. "I think the very first time I ever tasted unfiltered and unsulfured wine was in about 2008...I would hold bottles of wine and just go this is the best thing I've ever seen." 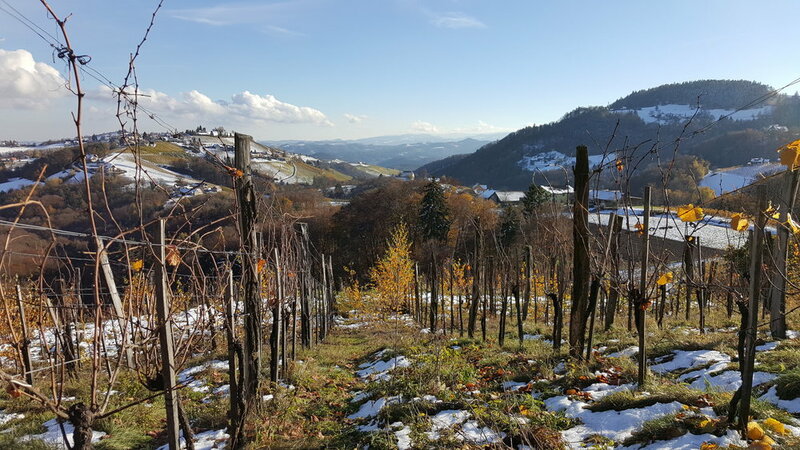 As well as Claude Courtois, Karl Schnabel in South Styria, Austria, is one of Campbell’s favourite winemakers. His vineyard called Koregg is pictured above. "It's amazing [that] wine, which you usually think of as an enabler at a party or something like that, can support this amazing form of sustainable agriculture." How could I have been alive for three decades and only then have realised for the first time how good a tomato could taste? That's what happens when you are farming well. But then the other crazy thing was that I had no idea, with all the vintages that I'd done and all the time I'd spent in wineries, that fruit could begin fermentation as fast as it did there. Mind you, his vineyard has been organic for decades, beautifully farmed for decades. Typically, your fruit would come in, you'd put it in the tank or whatever it is going to ferment in and the fermentation would start after maybe a day, maybe twelve hours potentially. A lady who I once worked with would douse the wine in a big vile of sulphur to sterilize it. So the fermentation would be deliberately halted until all the fruit came into the winery. But here, with Claude Courtois, all the whites were all pressed in basket presses and would begin fermenting and slowly bubbling away within about two hours! I'd never seen an agricultural product behave like that. That's what happens when you farm beautifully for decades. I'll add to that as well. So I was seeing fermantions that would start very easily but I would taste wine that had been sitting in barrels for say two, three or four years not topped up. Because the PH was so naturally low with these extraordinarily healthy grapes that in terms of volatility or brettanomyces or anything that we don't find super desirable in a wine it just can't happen in his winery. It's for a couple of different reasons. Largely it's because it has been farmed so well that you can leave a wine exposed to oxygen and because the PH is so naturally low and you have so much stability in your product that the wine can't turn to vinegar. So I had all of these questions that I had tried to answer in previous years doing vintage, especially in Australia, and I thought if you're not using sulphur I cannot understand how you can possibly have such a stable product. That vintage with Claude Courtois showed me how. Before then I thought had to use crazy high-tech equipment so the wine never has exposure to oxygen. I used to wonder how winemakers actually did it all because it looked impossible. Claude showed me that you just need to put the right grapes in the right place and farm well. His winery is about as archaic as you could hope for. There's no crazy cleaning equipment, there's nothing like that. It's all old wood, there's no stainless steel at all. He only washes things in one tiny corner of the winery. I realised then that the basis of all of this, to make a beautiful wine without adding anything to it, was good farming. So now, I don't consider completely additive-free wine and regular wine to even be same type of thing. After that trip I knew that I would only work with wines made like this and that I'd never want to sell wines with even a tiny, tiny bit of sulfur added to them. What I find so interesting is that it's all about good agricultural methods. There's a big push for organic and small-scale regenerative agriculture these days, and this type of winemaking is symptomatic of good agricultural practices. I think, as a consumer, that's where the message is usually lost. It's like, “Oh this thing tastes really fizzy!” No, this is representative of a better way of doing things. You know, we’ve got this clean eating movement, with veganism and stuff like that. When you go into all of these food systems, they all come back to the same thing: restoring balance with nature at a small scale, with no monocultures. And it's amazing [that] wine, which you usually think of as an enabler at a party or something like that, can support this amazing form of sustainable agriculture. It's the best, I just love it.